I've been wondering how effective advertising is for free promotions on Amazon. There are numerous sites to which you can apply for posting your free book. Some of these sites offer free advertising, others say they may or may not give you exposure but if you pay them some money they will guarantee it. They're only asking for five dollars but if you do that a few times it adds up. Do people really pay for advertising for a free book? Reminds me of the gold rush days when the only person making any money was the guy selling pickaxes and shovels. I tried an experiment with free promotional advertising last month. I put out Tapestries of Betrayal, a new title, for free for five days and promoted it everywhere I could for free. I had five free days on Tales of Woe and Wonder, an older title, that were going to expire, so I put that book up for free for the same time period but didn't do any advertising. Tapestries is a single story; Tales is a collection, but both fall in the fantasy genre. I expected the promoted title to do much better considering the hours I spent filling out submission forms. Ultimately, the promoted title out performed the non-promoted title but not by that much. Tapestries accounted for 58.5% of my free downloads while Tales took 41.5%. Remember that I had already done a free promotion for Tales a few months earlier. So, advertising appears to help some but readers still found the non-promoted title. Most of my downloads happen during the weekdays and fall off during the weekends. As I watched the download counts I noticed a bizarre but very telling pattern if my hypothesis is correct. Tapestries initially led the race and surged ahead, but when the weekend arrived, the counts for Tales surged and passed Tapestries. The early part of the new week saw Tapestries move ahead of Tales. So what happened during the weekend when Tales started doing so much better relative to Tapestries? I place advertisements in the back of my books for my other titles. I'm speculating that some people read Tapestries, liked it, and clicked on the link for Tales. When they saw that one was free, they downloaded it, too. If I'm right, it appears those in book promotions of your other titles are one of your most valuable selling tools. I'm listing a giveaway on Goodreads this month. 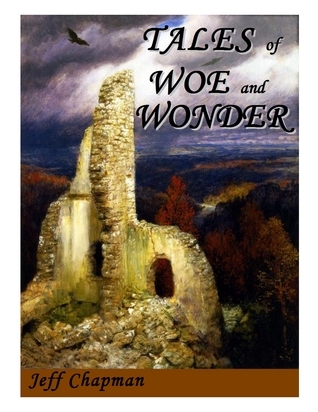 Five copies of the paperback edition of Tales of Woe and Wonder are up for grabs. Click to enter below. Good luck. In other news, Bards and Sages Quarterly accepted my steampunk-horror story "The Facts in the Case of M. Hussman." Inspired by Poe's "The Facts in the Case of M. Valdemar," the Hussman tale follows the efforts of a husband who helps his wife to cheat death whether she wants to or not. Look for it in the July issue. I'm also hard at work editing "Highway 24" under the direction of MuseItUp's editors. This is my first trip through a traditional publishing process. I'm thoroughly enjoying the ride, learning a lot, too. Look for "Highway 24" as an ebook sometime this spring. "Barbari," Andrew Miller's historical fantasy in issue sixteen of Silver Blade, is a humorous and poignant consideration of modern man's chronocentrism and misunderstanding of historical figures. Narrated by Julius Caesar, the story is a report to the Roman Senate on Caesar's campaigns in the Rhineland. He reports on his interactions with a most curious tribe known as the Nazii who occupy a luxurious country villa which appears then disappears at intervals of a few days. Caesar meets with the Nazii three times. At his first meeting, Caesar talks with a scholar who explains why the Nazii are there. Caesar considers the man's claims outlandish but listens politely. Still with an indulgent smile, I said that the scholar’s story was very interesting, and complimented him on his wine. In Rome, a man could win power only with his natural talents—for rhetoric, for war, for business. With the weapons of the Nazii, however, any fool could wreak devastation. At their third and final meeting, well, you'll have to read the story to find out how Caesar teaches them a lesson in Roman hospitality to barbarians. The comedy of the story derives from the Nazii's considerable misunderstanding of Caesar's personality and motivations. Miller turns the tables on history and shows us modern man as an ancient might perceive us. It is humbling and thought provoking to consider how unimpressive we are.